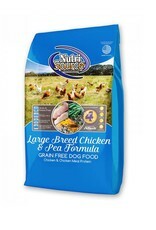 NutriSource® Grain Free Large Breed Chicken and Pea is ideal for breeds that mature at more than 50 lbs. 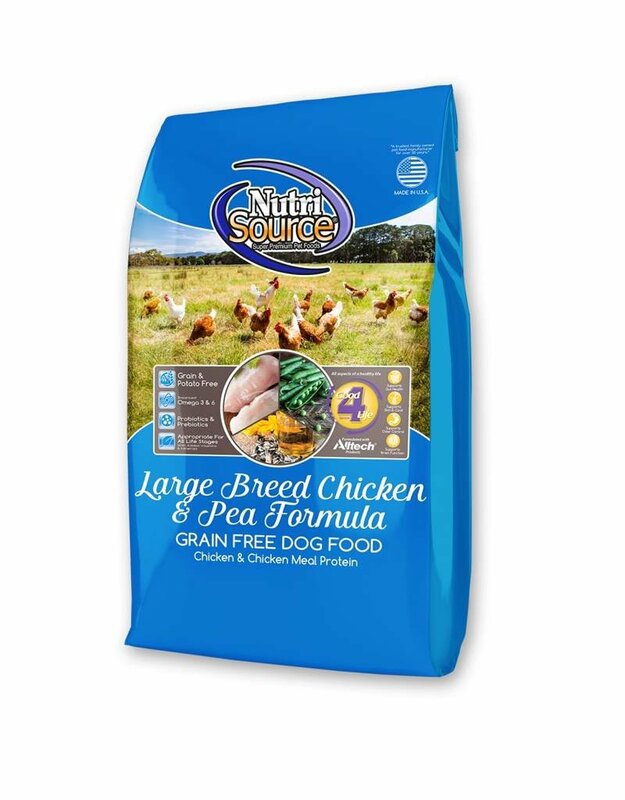 NutriSource® Grain Free Large Breed Chicken and Pea formula delivers super premium nutrition in a holistically formulated, easy-to-digest food for balanced muscular and skeletal maintenance in large and giant breeds. Our large breed meals are created specifically for bigger dogs, utilizing adjusted levels of calcium and phosphorus matched with balanced protein, fat, low glycemic carbohydrates, and calories to fuel large breed dogs to their fullest potential. We combine humanely certified chicken, low-ash chicken meal, North American peas and carefully selected holistic ingredients to promote unparalleled health for your large breed buddy. Health of your beloved pet is our #1 priority and our unmatched use of Alltech Good 4 life supplements guarantees you won't have any gas or runny stool issues and a healthier immune system, we guarantee it. Bio-availability is important to your pets long-term health so we created a larger-size morsel making it easier for large dogs to eat with a +85% digestibility rating - Health begins here! Chicken, chicken meal, pea starch, peas, pea flour,chicken fat (preserved with mixed tocopherols and citric acid), natural turkey and chicken flavors, tapioca starch, dried tomato pomace, calcium carbonate, dried brewers yeast, dicalcium phosphate, sunflower oil, potassium chloride, salt,salmon meal, choline chloride, minerals (zinc proteinate, iron proteinate, copper proteinate, manganese proteinate, cobalt proteinate, selenium yeast),vitamins (vitamin A acetate, vitamin D3 supplement, vitamin E supplement, niacin, d-calcium pantothenate, thiamine mononitrate, pyridoxine hydrochloride, riboflavin supplement, folic acid, biotin, vitamin B12 supplement), lactic acid, glucosamine hydrochloride, L-ascorbyl-2-polyphosphate (source of vitamin C), chondroitin sulfate, taurine, yucca schidigera extract, calcium iodate, rosemary extract, yeast culture (Saccharomyces cerevisiae), dried Lactobacillus acidophilus fermentation product, dried Enterococcus faecium fermentation product, dried Aspergillus oryzaefermentation extract, dried Trichoderma longibrachiatum fermentation extract, dried Bacillus subtilis fermentation extract. NutriSource®Large Breed Chicken & Pea Formula Grain Free Dog Food is formulated to meet the nutritional levels established by the Association of American Feed Control Officials (AAFCO) Dog Food Nutrient Profiles for all life stages including growth of large size dogs (70 lbs. or more as an adult).